This race report has been a long time in the making and even as I sit here now, I’m not really quite ready to write it. But I have to write it so I can move on to other topics that have been whirling around in my head. Normally race reports are easy to write because I’m usually really excited about how I ran or felt or because I’m annoyed by something related to race organization. I’ve been putting off writing this race report because all-in-all, it was a good race and yet I’m not satisfied. 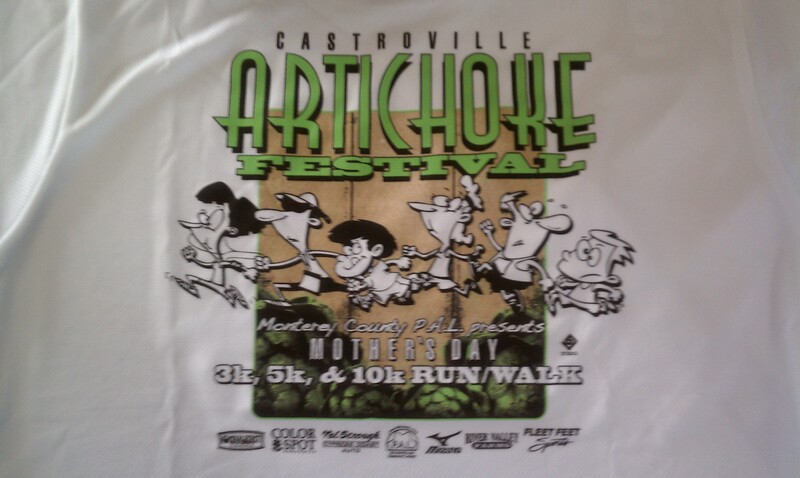 The MC PAL Mother’s Day Artichoke Run/Walk is held each Mother’s Day, which is usually a week before the Artichoke Festival. I’ve run this race a few times before even though it’s on Mother’s Day because my mom looks forward to the entry bracelet to the Artichoke Festival that is a part of the race swag. That’s part of my Mother’s Day gift to her. My parents don’t normally join me for Sunday events because of church – they’re rather inflexible about church while I’m extraordinarily flexible about it. But, they switched to a Saturday service a year or so ago so that excuse is moot now. I was able to convince them to participate in this event and that was a big deal because (1) this was my mom’s first 5k since her partial hip replacement last summer and (2) now I know just how much my dad’s knees bother him. Race day weather was perfect – slightly overcast and slightly chilly. There seemed to be fewer people than in prior years but that didn’t surprise me because there seemed to be significantly less advertising for this event than in years past. There was no registration link from the Artichoke Festival website and I didn’t get an email from the race organizers until the early bird deadline had come and gone. A nice technical t-shirt – I’m not one of those race snobs that won’t sign up for a race if the race t-shirt is a cotton shirt but it’s always a nice surprise to get a technical t-shirt as part of the race swag. A new race route – the race organizers worked to change the route so that runners spent less time running next to the highway and more time running in the artichoke fields. I know that a lot of people appreciated that because that meant less exhaust to breathe in but I rather like running next to the highway because cars sometimes beep and people randomly wave at the runners and walkers. Artie, the Artichoke Festival mascot was there taking pictures and hamming it up with the race participants and their families before the race. Course guidance – three youngsters on BMX bikes were on the course this year, with one rider leading the pack, another rider staying in the middle of the pack, and a third rider sweeping the children from the fun run. A 3k run for children. Re-establish the relationship between this race and the Artichoke Festival – an entry bracelet to the Artichoke Festival was not part of the race swag this year and we were all disappointed but even more than that, not being publicized on the Artichoke Festival website probably hurt attendance. Personally, I would rather have the entry bracelet than a tech t-shirt or even a cotton t-shirt. Go back to the old route – while it was nice to run along the artichoke fields, the 10k race route was not very graceful and included an awkward spur right at the end of the race. If I had been a 10k runner, I know I would have hated the new route. But also, the old route didn’t have us running along the highway for very long and, at 9 a.m. on a Sunday morning, there isn’t that much traffic on the highway anyway. Don’t run the children’s fun run at the same time as the race. Most races with a fun run have the fun run first and then the race but the new fun run took off at the same time as the race and followed the same course, which made the turnarounds a little confusing. I realize that we call it a 5k and a 10k but that doesn’t mean that the markers need to be kilometer markers. Most of us train using miles and we’re looking for mile markers. When I saw the big “1” sign, I looked at my watch and thought, “No way.” So I slowed down and by the time I realized that the signs were marking off kilometers instead of miles, it was too late to salvage a decent time for this run. Get a sound system that works for the awards ceremony. The announcer was louder when she was just speaking than when she started speaking into the microphone. I’m not sure what that was all about but if you’re going to use a sound system, make sure that it works. The food at this event is always great. Fruit, granola bars, mini energy bars, and bagels with cream cheese before AND after the race. This year there were lots of big fresh strawberries. It’s always funny to me to see non-racers pigging out at the snack table both before and after a race. We saw a lady who was neither a runner nor a volunteer cramming about a dozen granola bars into her pockets before the race. I guess people are hungry! Despite that list of things that I would change if I were in charge, this was still a good event and I would come back again next year even if none of those things change.